The political transition of January 2015 promised ambitious reforms and raised expectations accordingly. Two years on, serious concerns have emerged with regard to the National Unity Government’s reform project. Despite some successes, the current public perception is of a slow pace or even stagnation. This in turn has resulted in disillusionment and disappointment, with questions posed about the ability of the National Unity Government to govern effectively. These sentiments are justified in terms of promises made and the inability or unwillingness to manage expectations via a comprehensive communication strategy. 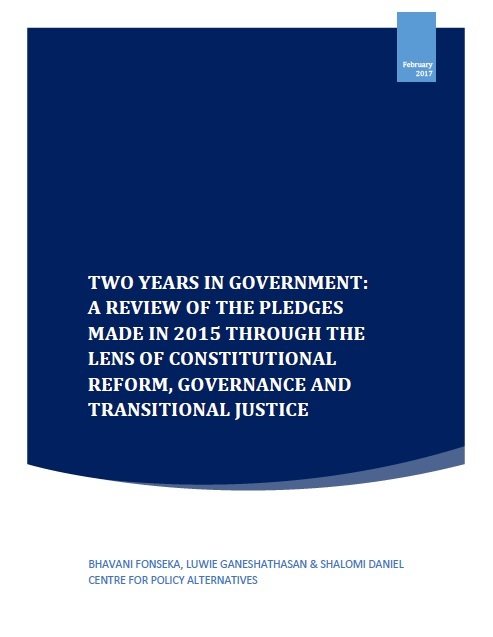 On the eve of celebrating Sri Lanka’s 69th Independence Day, the Centre for Policy Alternatives (CPA) launches a report exploring the pledges made in the areas of constitutional reform, governance and Transitional Justice and examines the progress made, challenges and setbacks. The areas reviewed are those in which proposed reform, if implemented in full, will significantly impact the identity of Sri Lanka and Sri Lankans, the structure of the state, form of government and governance, reconciliation and the culture of impunity. Sinhala and Tamil versions will be available soon.